Could french toast ever be sweeter than the batch I made this morning? This is not about a new gourmet recipe, nor is it about sticky syrup or sugar and cinnamon, but rather about a miraculous sweetness. So, I have made no less than 100 batches of french toast and with each batch I find myself desperate for Chaim Boruch to eat it. 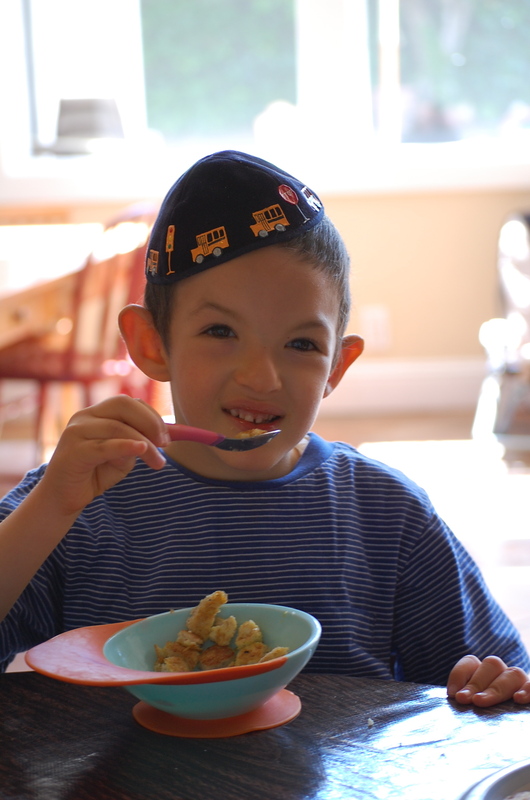 Well, feeding therapy for Chaim Boruch is less exciting than the kind I have in mind for myself…his is stressful. Slow. Messy. Frustrating. But today, maybe my ‘french toast prayer’ was said with more fervor and devotion. Maybe my ‘french toast prayer’ was answered. With a sprinkle of sugar, I placed perfectly cut mini squares into the prettiest baby bowl I could find, and then I used every ounce of strength to smile as wide as I could and present my gourmet dish. And with a lovely sing song voice I suggested that this 100th batch of french toast was indeed worthy of at least being tasted, I placed the bowl ever so gently before my son. Chaim Boruch took a bite and smiled. even my ‘french toast prayer’.